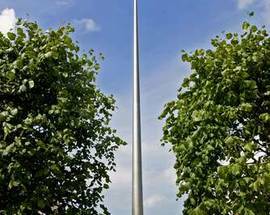 Piercing Dublin's skyline is this unmissable silver shard of stainless steel standing proudly on a bronze base symbolising Ireland's past. Rising 120m, the hollow structure is almost twice as high as Liberty Hall, Dublin’s original seven storey 'skyscraper'. 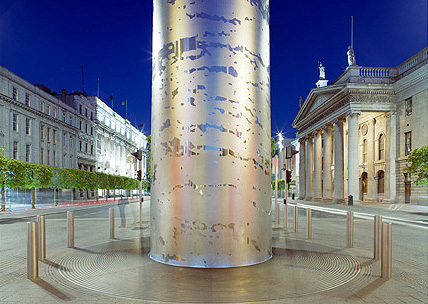 Its 3m-wide base tapers to a 15cm point, the last 12m of which provide an illuminated beacon for the city's night sky. Completed on 21 Jan 2003, the construction is designed to safely sway up to 1.5m in high winds, and 12000 tiny holes allow light to pass through, enhancing its daylight impact. Officially called the Monument of Light, early name suggestions included The Sword of Light, Dublin Gleams and Brian Boru (after the famous High King of Ireland). 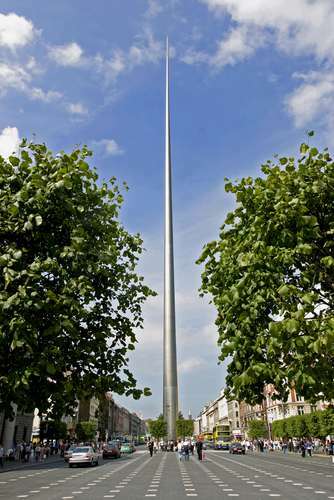 However, as befits an enduring trend to rechristen local landmarks, Dubliners have dubbed it the Stiletto in the Ghetto, the Nail in the Pale and several other names we dare't print. 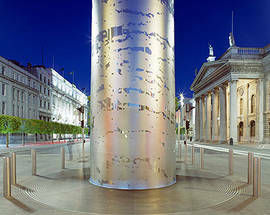 Situated outside the GPO, the Spire replaces Nelson's Pillar which was destroyed by an IRA explosion in 1966. You can see Nelson's surviving head at the Dublin Civic Museum.